3 Domes at the top with stairs in between. 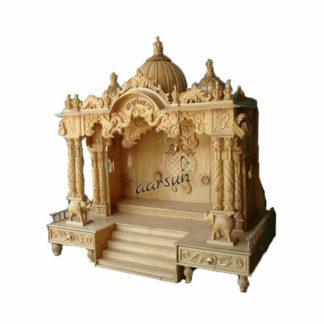 Aarsun woods brings to you the beautifully handcrafted Wooden Temple in Teak Wood with premium quality finishing made by skilled artisans. 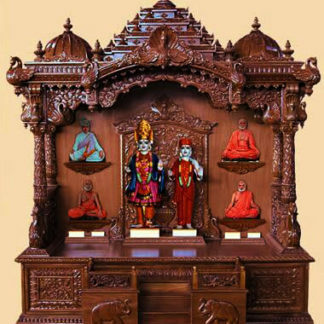 This beautiful temple is mounted on flat surface with beautiful drawers and cabinet at the front. Beautiful floral and elephant carving done over the cabinets and drawers which gives very elegant look to the temple. There are stairs at the base of the temple. At the main part of the garbagriha there are beautiful pillars which are carved with floral work. The pillars are mounted on two beautiful peacocks at the both sides. At the base of the garbagriha teak plywood work is done which gives a very shiny look to the base of the garbagriha and holy pictures of the famous lords are pasted over the back of the temple. Rising to the roof of the temple their is beautiful peacock and floral carving done over there which gives a very elegant look to this temple and at the top of the roof there is beautiful gopuram style dome is been place which is followed by the two domes at the top. At the mehraab of the temple there is beautiful peacock carving done which gives a very sophisticated look to the temple and raise the beauty of the temple.